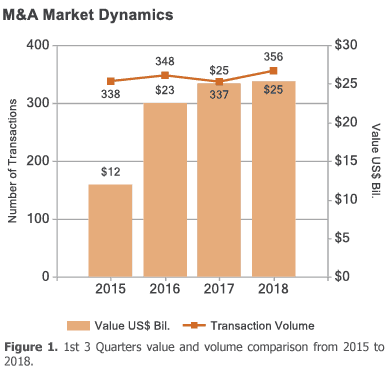 Q3 2018 Healthcare M&A Trends Report - Berkery, Noyes & Co., LLC. 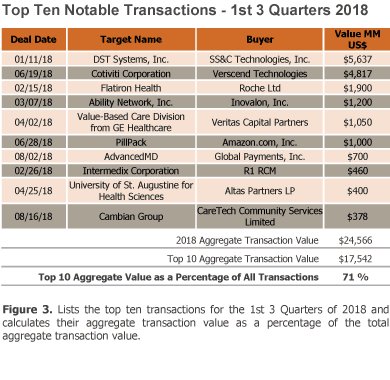 The largest transaction in Q3 2018 was Global Payments’ acquisition of AdvancedMD, a healthcare technology company that offers cloud medical office software to ambulatory medical practices, for $700 million. The most active acquirer through the 1st 3 Quarters of 2018, either directly or through an affiliated business, was Arsenal Capital Partners with eight transactions: Pirana Software, Analytica Laser, Newport Credentialing Solutions, Equipment Management & Technology Solutions (EMTS), BaseCase, KMR Group, Metrics Champion Consortium (MCC), and ACI Clinical. Total transaction volume in the 1st 3 Quarters of 2018 increased by six percent over the 1st 3 Quarters of 2017, from 337 to 356. Total transaction value in the 1st 3 Quarters of 2018 stayed about the same over the 1st 3 Quarters of 2017, at $25.4 billion. 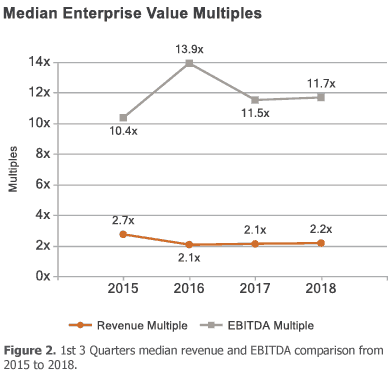 Median revenue and EBITDA multiples both remained nearly constant on a year-over-year basis. Through the 1st 3 Quarters of 2018, the median revenue multiple was 2.2x while the median EBITDA multiple was 11.7x. The top ten deals by value have seen two new additions since our half year report. In addition to the previously mentioned AdvancedMD deal, CareTech Community announced its acquisition of Cambian Group, a provider of specialist behavioral health services, for $378 million. These two transactions, with an aggregate value of $1.1 billion, represented four percent of transaction value in the 1st 3 Quarters of 2018 and 41 percent of Q3 2018 transaction value.